This colorful print was inspired by the coral reef that makes beautiful gardens on the ocean floor. While they are not actually plant life, but rather underwater structures of calcium carbonate, they are just as beautiful as any bed of flowers you'd find on dry land. The eye-catching design you see here really pops because of the bright neon hues. Your mail will definitely stand out from the rest of the pack when you use this stylish selection. But what's most impressive is how it makes your life a little easier. Your new labels are self-adhesive. That means instead of writing out your return address, you just stick one of these in place. 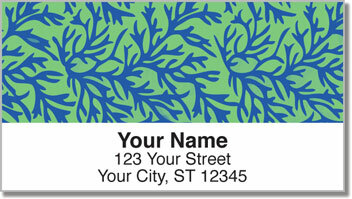 Get your very own Reef Print Address Labels today! Complete your order with a set of matching personal checks.